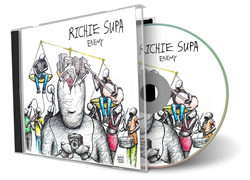 Richie Supa today released "Enemy," a record album of songs about recovery from addiction. Each song distills a bit of wisdom and experience meant to connect with the soul in ways nothing else can. This is my best expression yet of how music makes the difference at Recovery Unplugged. Richie Supa today released “Enemy,” a record album of songs about recovery from addiction. Supa is an award-winning singer/songwriter who’s written and/or co-written hits for Aerosmith, Richie Sambora, Gladys Knight & The Pips, Alexandra Guzman, Air Supply, Ozzy Osbourne, P!NK, Big Kenny and Willy Nelson, among many others. At 71, he is a recovering addict, clean for 27 years, and the Director of Creative Recovery at the Recovery Unplugged® Treatment Center, a unique facility for drug addicts and alcoholics in Ft. Lauderdale, FL. “This record has special meaning for me in that it’s a collection of music I use every week in my therapy sessions. Each song distills a bit of wisdom and experience meant to connect with the soul in ways nothing else can. This is my best expression yet of how music makes the difference in our program,” said Supa. In addition to traditional talk therapy and 12-Step treatment, Recovery Unplugged® uses an individually prescribed immersion in music therapy as its key modality. Clients don’t have to be musicians, or even musically inclined to benefit from the program. The center has had extraordinary results since its founding in September of 2013. The hallmark of the Recovery Unplugged® program is how it helps addicts personally identify with music in order to explore and better understand the root causes of their addiction. Music plays a pivotal role in breaking down emotional and psychological barriers, becoming a catalyst for introspection and communication. This music then accompanies addicts in recovery after leaving rehab, and acts as a trigger to ward off relapse. After its first 32 months of operation, the number of Recovery Unplugged® patients still clean exceeded three times the national average for addicts who have completed rehab programs. Enemy is Supa’s sixth solo album and is available on iTunes and a variety of other music retail outlets. Proceeds from the album’s sale will be donated to the Face The Music Foundation. Face The Music is an alliance of inpatient detoxes, residential treatment centers, outpatient treatment centers, individualized therapists and sober living residences committed to helping those who otherwise would not be able to receive treatment for substance abuse. The album’s executive producers are Paul Pellinger, Andrew Sossin and Marshall Geisser.